Background: Previous studies have developed methodologies for predicting the number of CD4+ cells from the total leukocyte and lymphocytes count based on mathematical methodologies, obtaining percentages of effectiveness prediction higher than 90% with a value of less than 5000 leukocytes. Objective: To improve the methodology probabilities prediction in 5000-9000 leukocytes ranges. 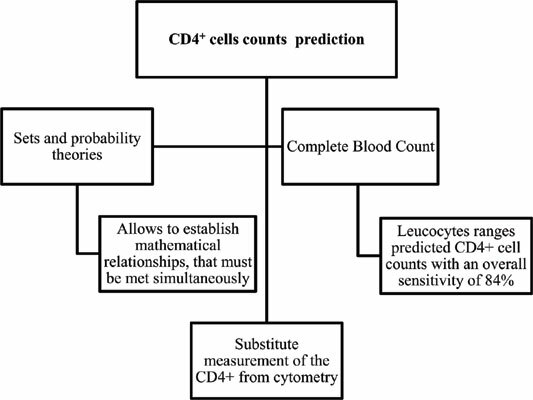 Method: from sets A, B, C and D defined in a previous study, and based on CD4+ prediction established on the total number of leukocytes and lymphocytes, induction was performed using data from 10 patients with HIV, redefining the sets A and C that describe the lymphocytes behavior relative to leukocytes. Subsequently, we evaluated with previous research prediction probabilities parameters from a sample of 100 patients, calculating the belonging probability to each sample and organized in predetermined ranges leukocytes, of each of the sets defined, their unions and intersections. Then the same procedure was performed with the new sets and the probability values obtained with the refined method were compared with respect to previously defined, by measures of sensitivity (SENS) and Negative Predictive Value (NPV) for each range. Results: probabilities with values greater than 0.83 were found in five of the nine ranges inside the new sets. The probability for the set A∪C increased from 0.06 to 0.18 which means increases between 0.06 and 0.09 for the intersection (A∪C) ∩ (B∪D), making evident the prediction improvement with new sets defined. Conclusion: The results show that the new defined sets achieved a higher percentage of effectiveness to predict the CD4+ value cells, which represents a useful tool that can be proposed as a substitute for clinical values obtained by the flow cytometry. CD4, blood count, lymphocytes, HIV/AIDS, prediction, probability.